Che polemica! I think everyone involved understands the challenge of arguing for future energy frontier colliders given that we no longer have the unitarity imperative; to characterize these early brainstorms as ignoring this reality is badly unfair. To understand the novel opportunities that might be offered at 100 TeV, we naturally start by generalizing simple scenarios we understand fairly well at 14 TeV. But of course this is merely the starting point; nobody believes that arguing for 100 TeV solely on the grounds of greater mass reach in 14 TeV standard searches will never get anything built. Another natural activity is figuring out all the possible higher-dimensional operators that we can probe at 100 TeV or with precision e+ e-, as you say, but even that is not going anywhere particularly novel. So we're really just at the stage of thinking and trying to generate new ideas. We're at the very earliest beginning of this endeavor and I think everyone has an appropriate frame of mind; something like the 100 TeV EHLQ document is not going to take form tomorrow. My sense is that you're either misreading the situation or deliberately mischaracterizing it. "we'd like to have a 100 TeV collider, now let's think how to best justify it to the funding agencies". Are we acting in good faith? The real reason is that if no next collider soon then the accelerator physicist will die out and we will not build a collider as easily if and when we truly need it. I understand it's just the beginning, and I worry about the direction. I don't agree that studying susy opportunities at 100 TeV is natural in any sense of this world, I rather think it makes us look silly. I would prefer, from the very beginning, a more sober discussion of the stakes involved. 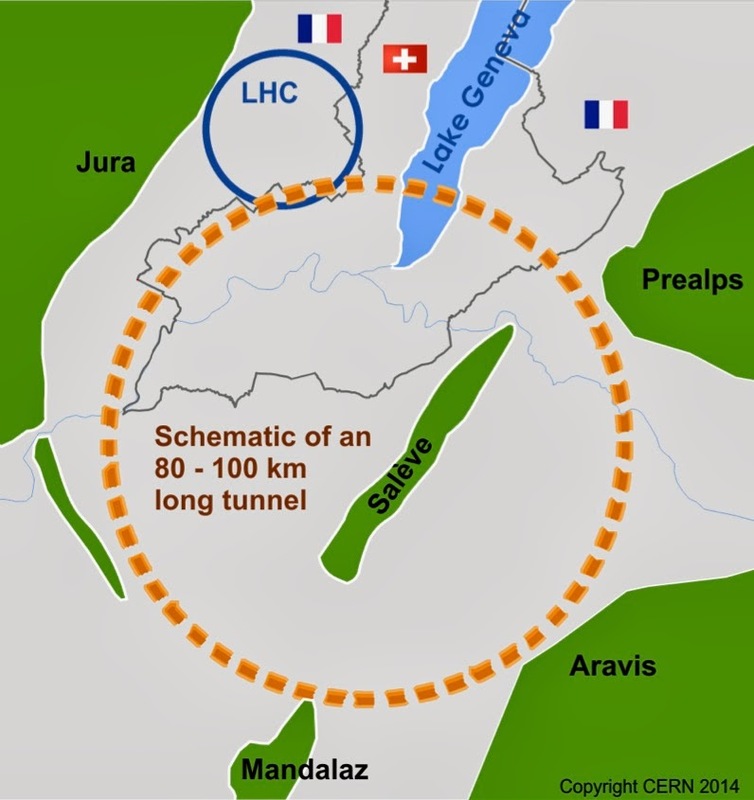 If as Nima says we are 1% unlucky in not having found SUSY then in 99% of the landscape the LHC has found SUSY. If we are 0.01% unlucky then was SUSY found or not found in the remaining 99.9% of the landscape? Are these planned 100 TeV accelerators basically scaled-up versions of existing technology, or are advanced concepts such as wakefields part of the program? Because I'd much prefer first spending, say, $100 million to figure out if any of these advanced concepts could work and thereby slash the construction cost for reaching high energies. The current plans are based on a similar technology as in the LHC. The energy gain would come from a bigger ring + two times more powerful magnets. I often hear naturalness mocked, but I don't often hear explained exactly why it is such a dumb idea. The idea is something along the lines that a 1-in-10000 chance coincidence is unlikely to happen without some underlying explanation, right? Aside from anthropics, where is the fault in that notion? And more importantly, if it's so stupid and so many people believe it, then wouldn't it be valuable to work to prove it wrong by demonstrating that such a coincidence really does exist? @Xezlec: The issue isn't per se that naturalness is a bad idea, it's that it's been sold * so * strongly and taken * so * seriously that it just gets old after a while. Yes, it is nice to think that we don't live in a special place in parameter space, just as it's nice to think (and is empirically true) that we don't live in a special place in real space. Yes, it is true that Wilsonian field theory calculations suggest that the parameters of a UV extension of the standard model would generically have to be fine tuned in order to produce the low energy behavior we see. Yes, it is true that naturalness is a hint that there might be something interesting to find, and yes there are historical examples of apparent fine tunings being explained with new physics. But that's all it really is, a hint. We don't have a firm calculation that really proves there is a definite inconsistency in the Standard Model. Naturalness has been used to justify a disproportionate amount of particle physics research, IMO, compared to the degree of belief we should have that the argument is correct. Especially after the discovery of what at least appears to be a cosmological constant! Who knows what physics lies at high energies, it could easily be that we simply have the wrong perspective on how to look at what's going on. It's when you hear things like "the LHC * MUST * discover SUSY because otherwise there is a fine tuning problem," over and over and over, that you get frustrated. And then the LHC * DOESN'T * discover SUSY, at least to me it seems pretty bold for someone to say that this just means that SUSY is just a little bit higher than you previously thought. It's not even that SUSY is a bad idea--I think it's a really nice idea--it's just that some people are very adamant about a particular position that isn't backed up by data and sometimes it seems that the more the data pushes the more they are willing to go to wilder ideas. I think people continuing to use naturalness arguments to justify a future 100 TeV collider should actually be expecting LHC14 to discover SUSY using the same naturalness arguments -- I think one can show by same arguments that it is much more likely that SUSY is found by LHC at 14 TeV than being missed there and found in a bigger collider. However I don't see people really expecting LHC 14 to deliver SUSY. @Xezlec -- In my opinion, naturalness was a good reason to take SUSY seriously. However it has not been found where it should naturally be there -- the natural scale for SUSY is about 3 times the Higgs mass. Once we crossed this threshold and know the EW scale is unnatural, then I don't see how we can continue to apply naturalness arguments to the weak scale. At which point are people going to abandon the religion of SUSY? The best bet is to improve the detectors at 14tev and add more triggers and improve the data crunching. Repeat every 5 years to keep skills highigh. I think there is no use building next proton collider. and after that we could thing how large energy-frontier moun collider should be built. A 100 TeV collider is still the most sensible HEP experimental investment. If a fraction of the $ needed for a 100 TeV collider was diverted to novel acceleration technologies, I think there is a better chance of long term success for the field. I think we are stuck in a rut. The only thing we seem to be able to do is just build the same thing over and over again, only bigger and more expensive (and larger collaborations full of middling scientists). I also wonder what the applied technology spin-offs might be from novel acceleration technologies, or what other fields of science might benefit. In the meantime, I am greatly sympathetic to high-precision optical experiments like ACME, and related ideas, because they are cheap and because the people trained on those experiments have skills that can be applied to a lot of other questions in science. Reassuring that I am not the only person who thinks it's crazy to be fixating on scaled-up conventional accelerators instead of exploring the currently low-funded opportunities for advanced concepts. Draw up a decision tree using reasonable probabilities and costs and see if there is any way to justify this strategy. Couldn't a 1000km tunnel be built above the ground in a very dry inhospitable? I mean, reasonable to build. We dried building a particle accelerator in a dry, inhospitable place far from civilized lands. Eventually the SSC got canned. 1. $100-$500 million for improved computing power to do lattice QCD calculations both to make theoretical predictions that reduce the MOE (especially for discriminating between backgrounds and signals), and increase the power of existing experimental data and new searches with the same equipment, and would allow more precise extraction of Standard Model constants from existing data. We are pretty much guaranteed to be able get seven or eight loop QCD beta functions (the current research effort is devoted to five loops and each successive term gets much harder than the one before it to calculate) and with more accurate calculations, greatly increased theoretical precision, for example, simply by investing the money to get the computational power to do the job. 2. $1-2 billion for deep space satellites. The only thing we can be absolutely exists in terms of BSM physics is something to explain dark matter phenomena, either at least one new particle or at least one new force or both. The best way to narrow the dark matter parameter space is with precision astronomy observations that the atmosphere obscures, not with a 100 TeV collider. We can be vastly more efficient in our search for dark matter particles at some future experiment yet to be designed if we use astronomy observations to more tightly narrow this parameter space first. It is the difference between looking for a face in a crowd based on a photograph v. a police sketch artist's effort from an eye witness's blurry recollection. We can also, for example, much more accurately triangulate star distances with a pair of distant deep space satellites which would calibrate all other astronomy observations. And, better observations of neutron stars, pulsars, cosmic rays, etc. provides a different way of doing super high energy HEP with nature paying the electric bills for it. Also, realistically, the only application of 100 TeV+ scale phenomena is cosmology anyway. Very early universe observations from deep space also narrow the parameter space of 100 TeV scale physics and let us know what we should be looking for. 3. $2-3 billion+ for neutrino physics experiments (e.g. astronomy, reactor, neutrino beam, double beta decay). A little more investment here to pin down the last few Standard Model parameters and determine things like the Dirac v. Majorana basis of the neutrino mass has an immense impact on the parameter space of BSM physics. 4. Continued funding of B factories. There are dozens of meson resonances that we don't really understand well. This is an area of particle physics where predictions are frequently not matching up with experimental results. You don't need a 100 TeV collider to investigate, e.g., 0.5 to 2.5 GeV scalar and axial vector mesons. 5. $100-500 million or so to push the envelope on exclusions for proton decay, magnetic and electric dipole moments, non-collider based axion field searches, entanglement experiments, etc. 6. $100-$200 million on non-SUSY/non-stringy theoretical work. We have all of our eggs in one or two baskets. The LHC has cracked many of the other contenders. Like anything, there is declining marginal benefit to funding yet another SUSY theorist. If there is money left over, then by all means, lets go buy a 100 TeV collider. @Anonymous from Feb 27, 01:58: While the 100 TeV-machine study uses conventional technology, there are also studies how to use plasma wakefield acceleration for a multi-TeV electron positron collider based on the LHC, and there are experiments developing the necessary accelerating structures. @Daniel de França MTd2: The problem with dry, inhospitable landscapes is the missing infrastructure. I agree with andrew. Sure, 100 TeV would be nice, but there are so many things you can discover with lower energies for the same costs.